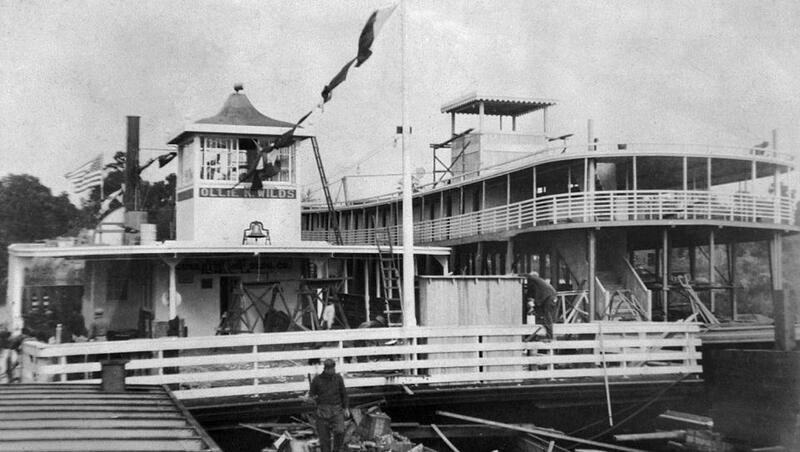 Detail from an original photo taken at Natchez, Mississippi on March 27, 1928 of the ferry OLLIE K. WILDS, which was owned by Captain George Prince of the Royal Route Line and operated at Natchez between 1920 and 1940. Back to Oz again . . . this is the Ferryboat Dorothy. I sent a tif file on this last night but have cleaned it up a bit and made a jpg for you. Great little boat with a nice camera angle on it. From a tiny 3 X 4 inch snapshot. 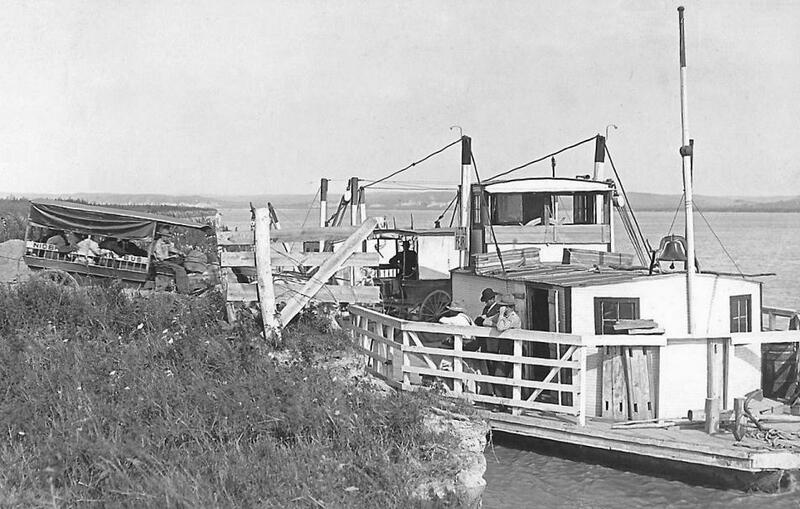 Ferry LITTLE PEARL which ran on the Missouri River between this landing at Niobrara, Nebraska and Running Water, South Dakota on the opposite shore. Not listed in Way's Packet Directory. 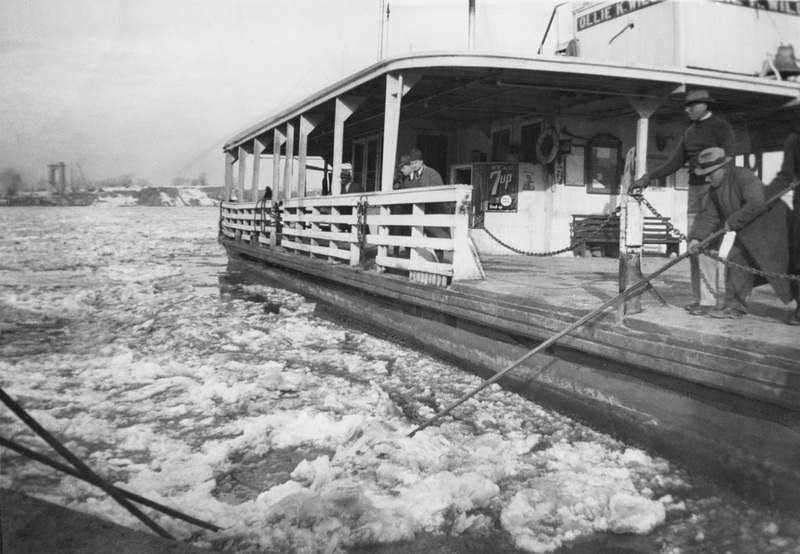 News photo of the ferry OLLIE K. WILDS "on ice" dated 30 January, 1940. "Huge ice floes floating down the Mississippi seriously impeded river travel at Natchez where ferries took two hours to cross the river. Here is a ferry, which, incidentally, was frozen tight all night, making the first trip across the ice-studded river." 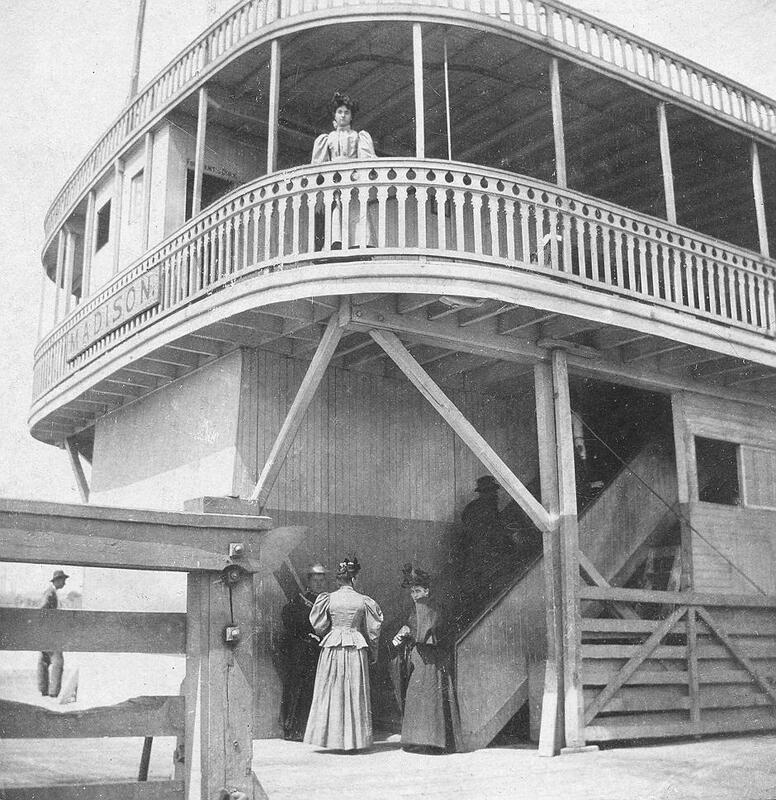 The other photo of the WILDS in a boat yard for maintenance is from the Murphy Library. "Looking up the Ohio River, just above Portsmouth, Ohio. August 8, 1939." You will find in this picture the remodeled Transit which is now The New Era . . .
Will accommodate 6 Ford traveling cars and will carry more tonnage per truck than Str Albert. Made trip from Pittsburgh to Welkberg (?) actual running time 10 1/2 hrs. Attached scan of a real photo postcard of the ferry/excursion boat SUNSHINE that I just received today. The focus is fine on the paddle box and forward on the lower deck but the boiler deck and pilot house above are out of focus for some reason, maybe a quirk in the lens on the camera that the photographer used. "This is the Excursion to Pittsburgh picture taken at Coraopolis lock." The Ohio River lock at Coraopolis is called Dashfields, it is between Pittsburgh and Monaca, both in Pennsylvania. The name on the ferry boat's pilot house is H&C No. 1 which Ed Langford of Marine Supply Co. in Memphis bought from H.E. Bellinger of Tell City, Indiana who very probably knew our hero Bert Fenn. According to the news clipping on the back of this photo from 1954, the ferry was in the process of being converted into the MEMPHIS QUEEN, the first of a fleet of Mississippi River excursion boats that would later include the BELLE CAROL, the MEMPHIS QUEEN II and the MEMPHIS QUEEN III. The ferry looked plenty authentic in style before she was made over to suit the tourists' fantasy of what an old fashioned packet boat was like. Additional notes are included under the photograph below. 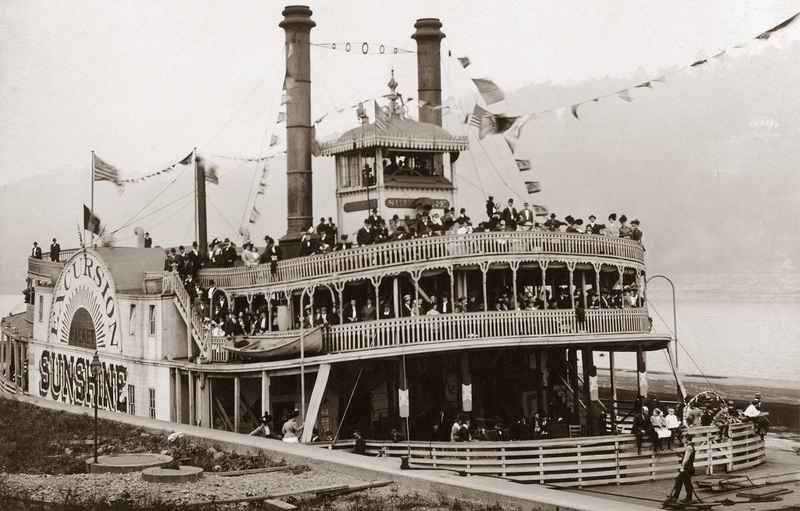 The Memphis Queen, a diesel-powered sternwheeler, will begin operating here as a sightseeing craft in two weeks as an attraction for tourists and conventions. Memphis, made famous in Mississippi River stories for more than a century, now has its own sternwheel harbor sightseeing boat, the Memphis Queen is anchored at the foot of Monroe. Ed B. Langford owner of Marine Supply Co. at 628 Union, said yesterday he bought the craft partially to satisfy the curiosity of tourists who come to Memphis expecting to be able to take a ride on a river boat with a power wheel on its stern. Mr. Langford plans to use the Memphis Queen primarily for entertaining conventions, Sunday school groups and other organizations, he said. Powered by a Diesel Engine; the Memphis Queen is 90 feet tong and 43 feet wide. It has a shallow draft making it a simple manner to park on a sand bar for a few hours for a party. Remodeling work began yesterday for the two-week job of readying the boat with a second deck as a cover on each side and 10 feet forward of the pilot house. It will have a dance floor. From several hundred suggestions, Mr. Langford picked the name, "Memphis Queen" and will give Mrs. Joy Evans of 3000 Kingston Road a $10 prize for, submitting it. He bought the vessel from H. E. Bellinger of Tell City, Indiana. Taken aboard the ferry MADISON. The solitary lady on the boiler deck stands next to a door with a sign above it that says FOR GENTS ONLY. The three ladies down below have an air of mystery about them, the one on the right is reminiscent of Almira Gulch (in Kansas) who became the Wicked Witch of the West in Oz. built Jeffersonville, Ind., by Howard, 1892. 157.4 x 45.4 x 6.1. She was a centerwheel ferry owned by Madison County (Illinois) Ferry Co. Still listed 1908, maybe later. 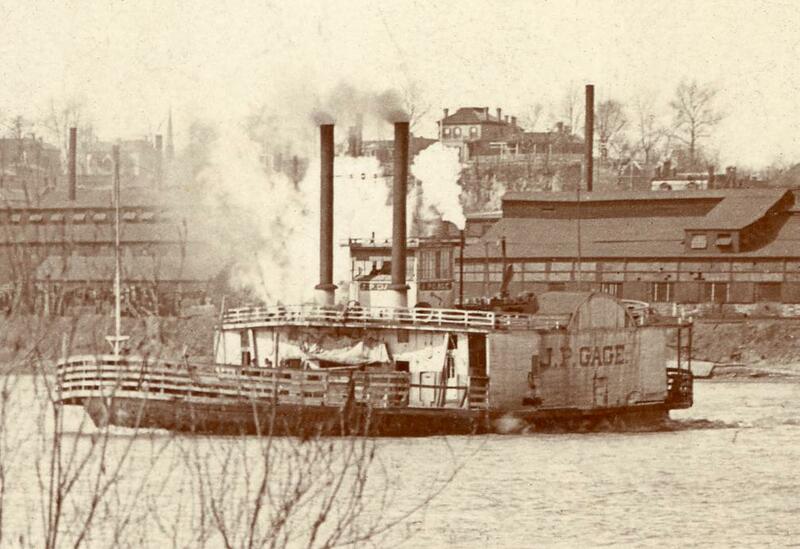 The first image in sepia is a 1.10 inch wide detail of the ferry J.P. GAGE scanned from a 4.70 x 6.75 inch albumen print just received from a dealer in Camdenton, Missouri. 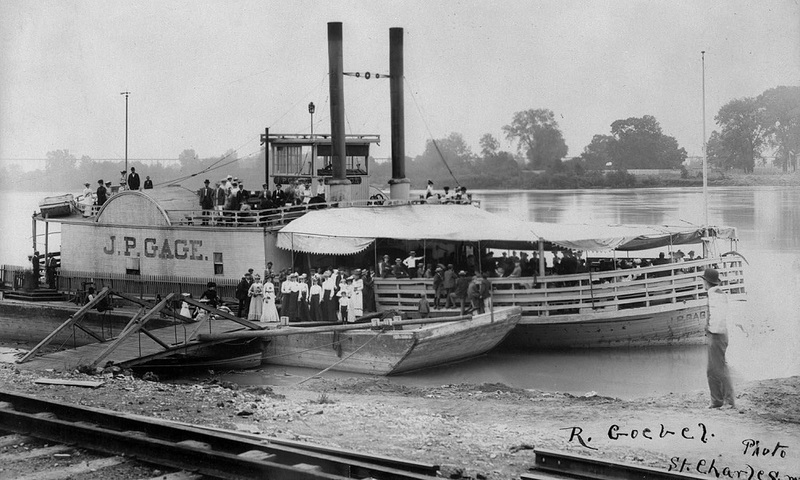 The second photo of the J.P. GAGE in black and white was taken by photographer R. Goebel at St. Charles, Missouri on the Missouri River. This photo is from the La Crosse collection. 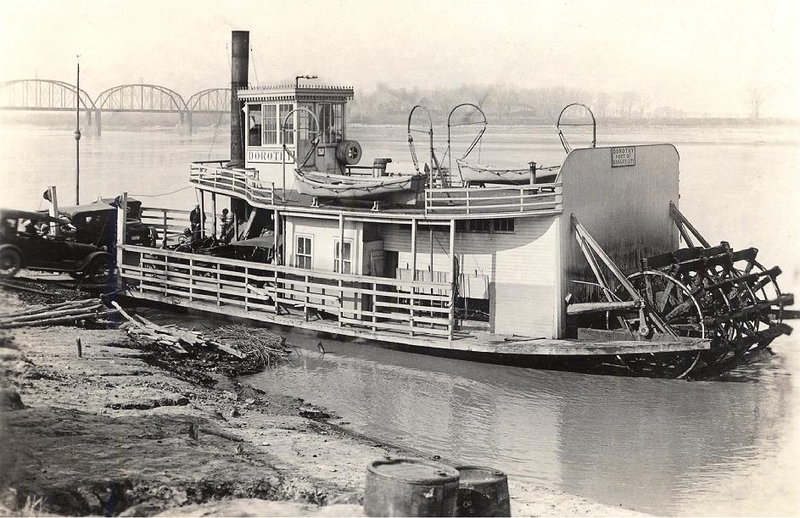 Built in 1884 at Clinton, Iowa for the St. Charles Ferry and Transportation Company Operated on the Missouri River at St. Charles, Missouri. W.T. Cope (pilot, 1894) The GAGE was snagged and sank on September 7, 1893; then raised. 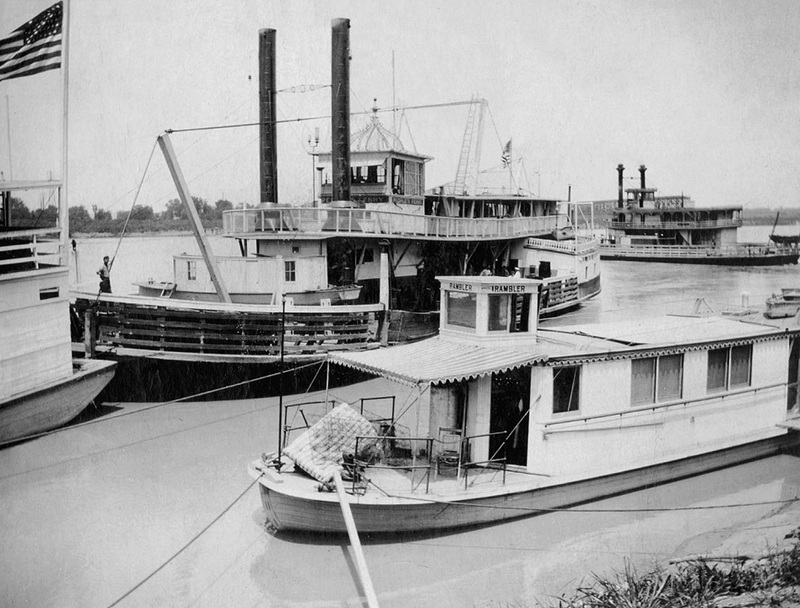 In 1898 she was transferred from Rock Island, Illinois on the Mississippi River to Dardanelle, Arkansas on the Arkansas River. 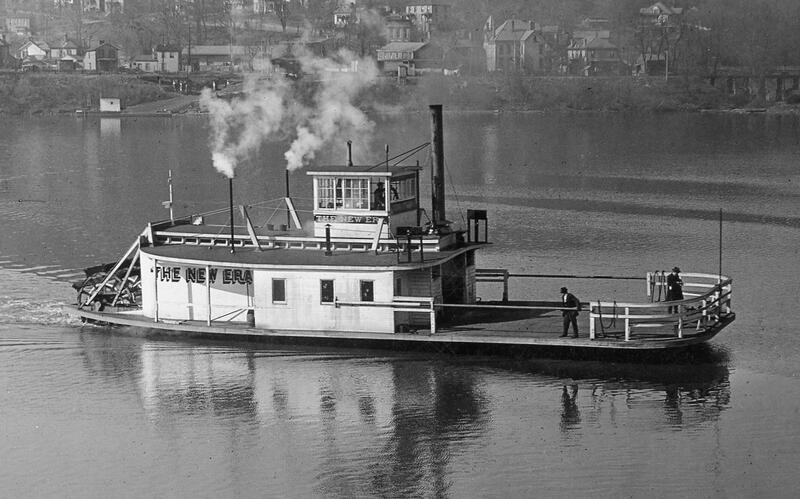 In 1928 she was enroute down the Ohio River with the ferry CHARON and wrecked the CHARON on the outside lock wall OF Lock 23. 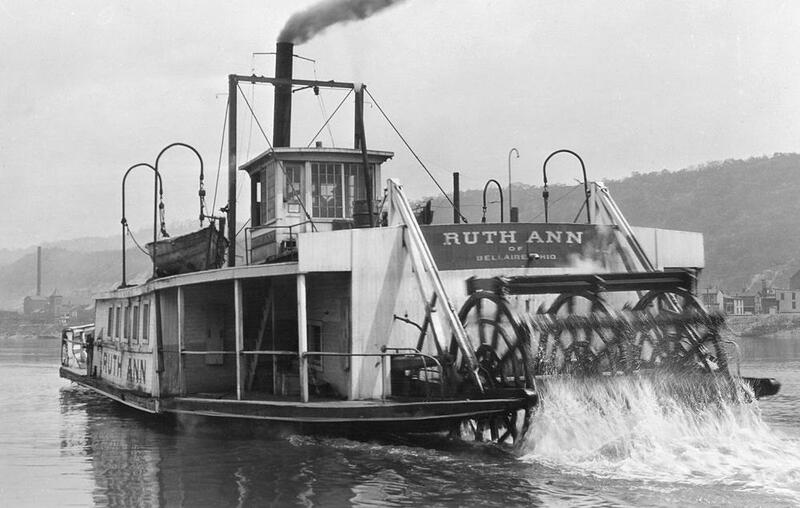 The RUTH ANN tried the Levanna-Dover ferry run but didn't succeed. She sank at Dillies Bottom near Levanna, Ohio in 1934, very close to the site where she had been built. Ferry named EDITH. Fred Way lists a few boat with that name but doesn't describe them as ferries. There are 4 men on deck and 1 pilot, all who may have been African American. Would guess this could have been on a river Down South somewhere, perhaps in a state like Louisiana or Alabama. Attached a really interesting picture from La Crosse taken on the Quincy, Illinois waterfront on the Mississippi with 2 ferries and a couple of other boats. 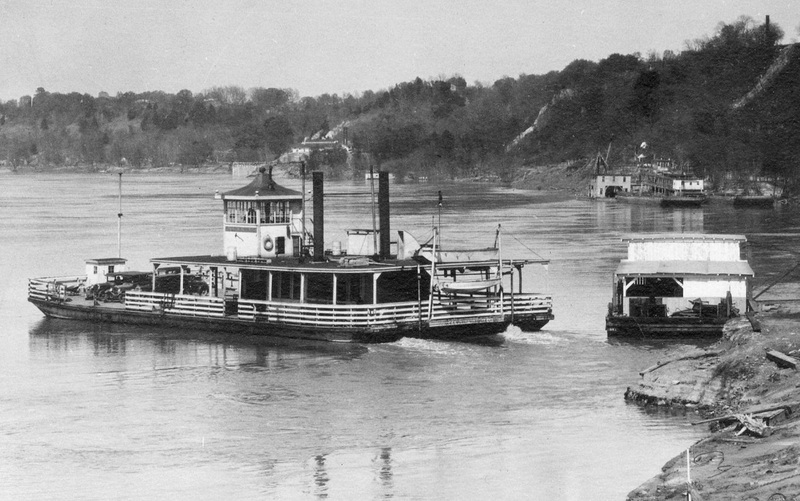 The PEOPLE's FERRY (1889 - 1906) is the big one at center, the ferry in the distance on the far right is not identified but resembles ferries that worked at the next big town down the river on the opposite shore: Hannibal, Missouri. The little RAMBLER in the foreground looks like someone's pleasure boat and they're airing out a mattress on the bow, might've been busy the night before. 98.9 feet long One boiler 44 inches by 18 feet. Owned by J.F. Jividen and operated by him and his brother Charles. 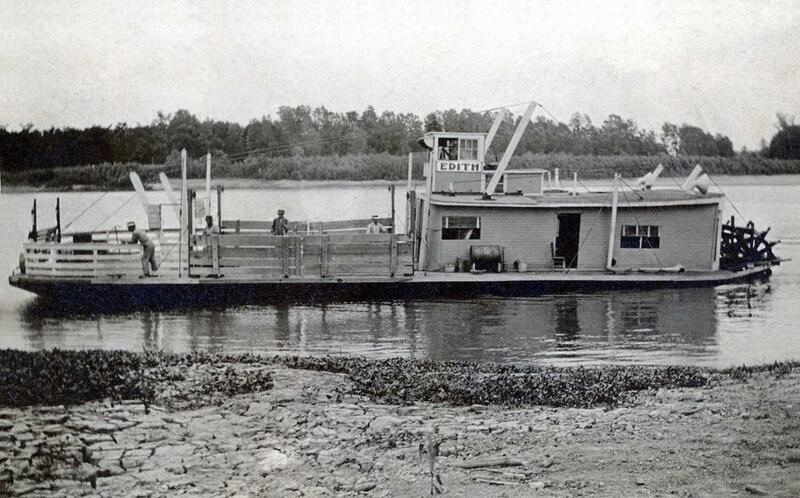 This ferry operated at Pomeroy until the bridge across the Ohio River to West Virginia was completed in 1928 and after that she ran at Proctorville, Ohio until she was dismantled in 1935. Pomeroy, Ohio across the Ohio River is seen here from the landing in the foreground at Mason City, West Virginia. Pomeroy was founded in 1804 and named for landowner Samuel Pomeroy. The village was incorporated in 1840, and designated county seat of Meigs County, Ohio in 1841. 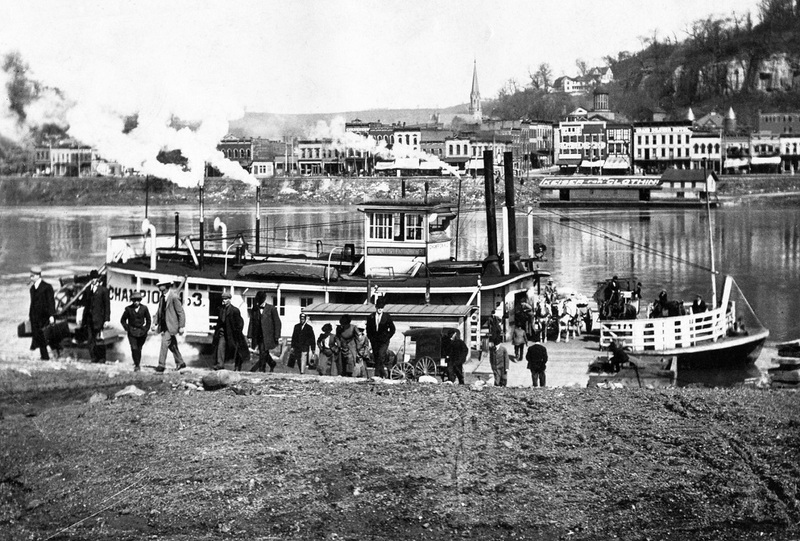 The first coal barges on the Ohio River were loaded there. 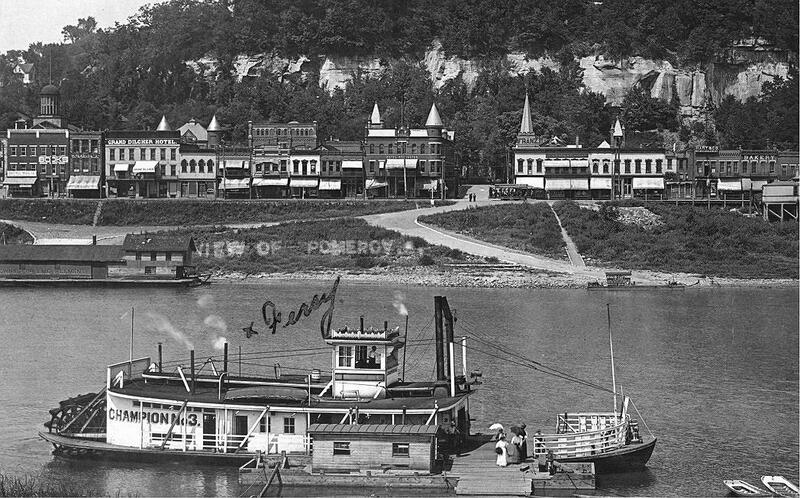 Today Pomeroy retains this appearance and still has many of the commercial buildings seen here on the waterfront.